40+ Style » How to dress after 40 » How to enhance a basic outfit – See how I created 5 different looks with the same base! 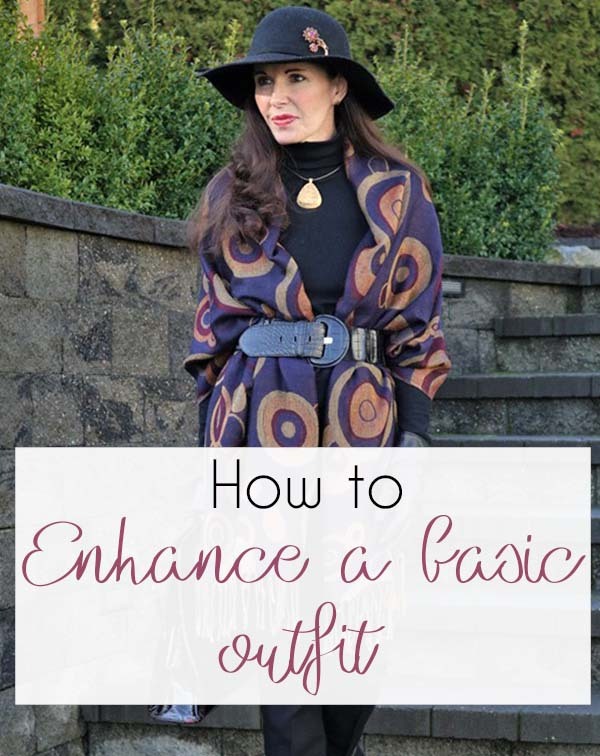 How to enhance a basic outfit – See how I created 5 different looks with the same base! A fabulous way to make sure you’re going to make not only a good impression but a fantastic one, is through accessorizing. I’d like to talk about the role accessories play in enhancing a look or playing up a feature. Their impact can be likened to a punctuation mark, giving a sentence a stronger statement. Only in the case of building an outfit we want to emphasize our curves, highlight our faces, add colour and generally enhance the level of panache we’re projecting. I’m going to demonstrate 5 looks. 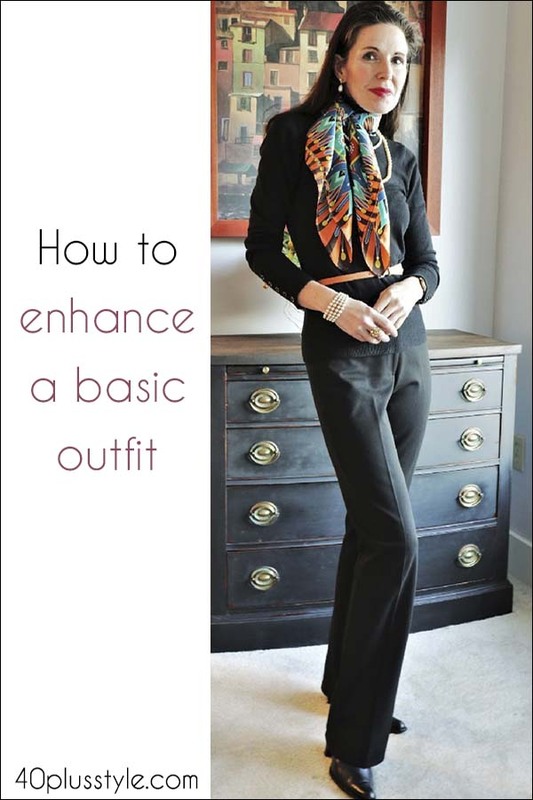 I’ve chosen to wear a basic black turtleneck and black pants and boots for every look, so you can see how easy it is to dress up or go for a more casual look, depending on how you wish to accessorize. In this outfit, I’m wearing a fun patterned wrap. This stylish look, works particularly well with the lightweight material that wraps are made of. The thick belt works perfectly here, but you can use a thinner one as well. 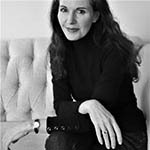 I’ve chosen a patent leather handbag, which picks up the burgandy in the pattern and black leather gloves to echo the black in my boots, hat, sweater and pants. A simple gold pendant necklace and gold stud earrings is all I need for jewelry, as I’m wearing my large brimmed wool hat with a gorgeous vintage brooch for some added flair. 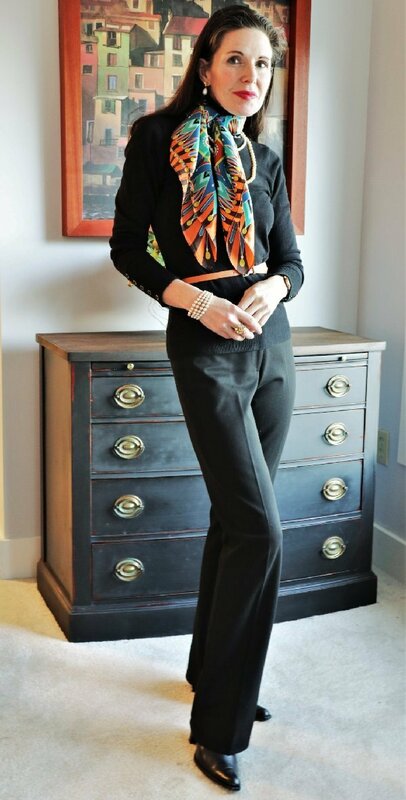 In this look, I chose a rectangular paisley silk scarf. I paired it with an heirloom crystal brooch also of a paisley design. I wrapped the scarf around my neck and loosely formed it into a semi bow, then slid the brooch into the middle to hold the creation fast. This was quick and easy and added instant style to my basic outfit. I also chose to wear a gold cuff, watch, rings and belt. I brought along a green mock croc clutch for some added interest and style. Brooches add interest and zest to a basic outfit. Here, I’m wearing them in a cluster on my oversized belted blazer. I also have a lovely colourful butterfly crystal piece on my beret. Whether they’re heirloom pieces (like some of these) or new, a brooch will definitely add panache to any outfit you place it on. Here, I’ve taken a square scarf, folded it into a triangle, turned the ends under until it formed 1 long straight piece. Then, I tied it into a simple square knot and let the ends hang elegantly down. I wore pearl drop earrings, a few strands of pearls and an heirloom pearl bracelet. I’ve also added a thin coloured belt to compliment my scarf and accentuate my waist. 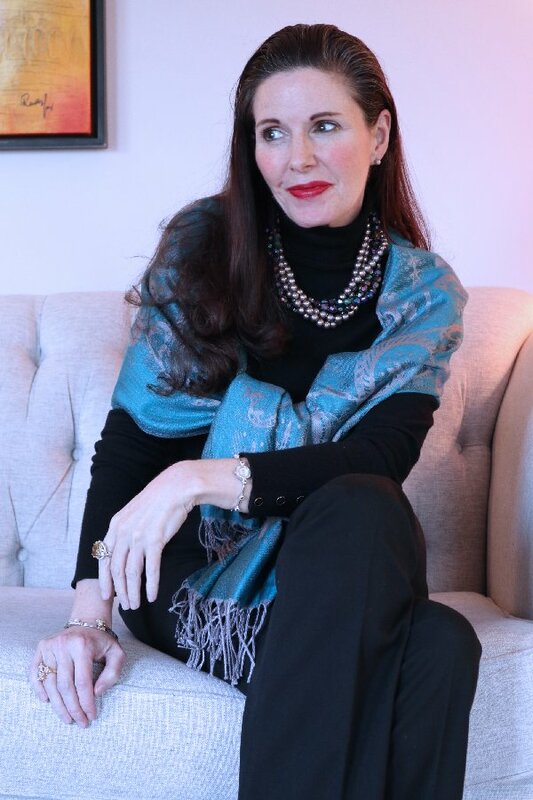 The pashmina, gives a luxurious hug of both style and elegance. Similar to the wrap, it can be worn in many ways. Here, I’ve worn it gently tied with simple grey pearl earrings and a multi strand statement necklace of grey pearls and shiny beads. The necklace, in combination with the pashmina gives this basic look, office to after work appeal. In conclusion, don’t overlook accessories, they can turn a basic outfit into a fabulous one. A tiny brooch cluster, a simple scarf or wrap, belt, hat or a great necklace makes an exceptional difference to your look. On average, scientists say that when making a first impression, in a mere 7 seconds you are judged solely on your appearance and that impression will last forever. So, regardless if you’re making a first impression or adding a few simple touches, accessorizing truly does wonders for upping your style game and enhancing your overall appearance. Which is your favorite from these 5 looks? Karen Amantea, lives on Vancouver Island, in Canada. She loves the rain forest, enjoys photography and is devoted to her yoga practice. 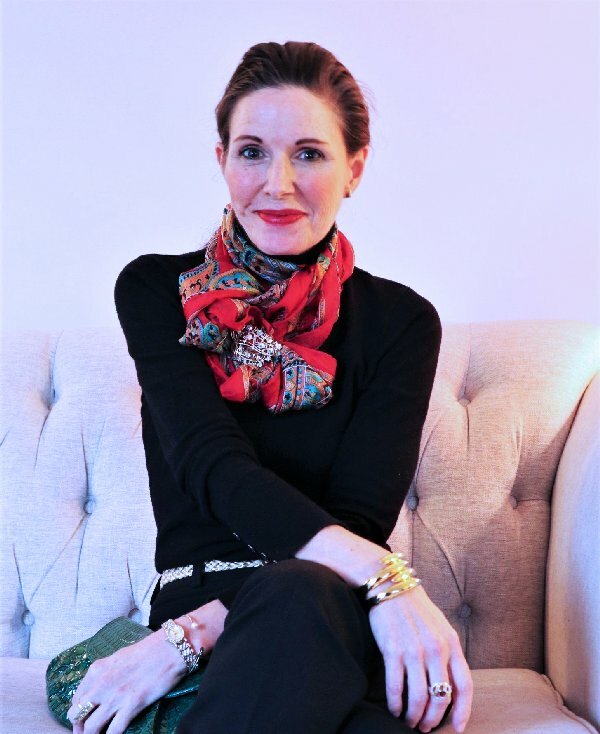 Connect with her in the 40+community or in the 40+StyleClub. My scarf collection grows weekly. Now I need wraps. Sounds classier than shawl! Luv them all but first intrigues me. You’ll find wraps so versatile. A great alternative to a blazer or a jacket. I think the first belted look would be fabulous on you. It is very hard to pick a favourite one. I think you did a splendid job!! And I learned a thing or two which I will apply. Your elongated neckerchief is a find. I wonder whether mine with have the same length. I usually have ends which are far too long or too short. The belt on your brooch outfit is fantastic. Is that a brooch attachted to a belt or is it an integrated part of it? I have a few silk scarves which slither and slide. Putting a brooche on them to prevent that is a very good solution but I am afraid of destroying the silk scarf with the pin. And the belted wrap… doesn’t that limit your movement? As in “can’t lift my arms”? You see, you got me so interested that I have a lot of questions. I know what you mean about the length of the ends of your neckerchief. If you find they are too long, you can try wrapping the scarf around your neck a second time to shorten and then tie the knot. The piece attached to my belt is actually a pearl and semi precious stone vintage buckle (another fabulous thrift store find). It clips on and off via a snap on my leather belt. Adding a buckle clasp to the back of a large brooch, would be an easy conversion for a skilled craftsman to do. I wish you had some lovely thrift stores to visit where you live so could you explore this possibility. I have found that my silk scarves slide side to side as well, Greetje. Pinning them in a lovely configuration such as this one, serves a twofold purpose – function and style. I have never had an issue of a pin destroying my scarves. The belted wrap and being able to lift your arms. How you create this look is to belt only the front portion of the wrap or cape (having the belt flat against your back (not the back of the wrap or cape fabric), allowing the back of the wrap to flow freely, creating a lovely silhouette from the side. This allows your arms the freedom of movement they need as they are not confined within the fabric. I’m so very happy that you found inspiration in the article, Greetje. I sincerely hope that you’ll be able to make these ideas work for you. Hi Karen, just found a lovely peachy orangy wrap. Second hand. Lambswool from a nice Irish brand. Just € 40. And I am going to belt it just like you did. Thanks for the inspiration. This is wonderful news. And a lovely Irish lambswool, too. I hope I’ll run across a picture of you wearing it! Oh you will. Don’t know yet when, but within a couple of weeks. Just have to think of how to style it my way rather than classic as I am not the classy type haha. Well, my styling of the wrap was useless, faulty, not nice… I have stronger words for it but I will remain a lady. May I use your photo as an example how it should be done? I am planning my blog post on Sunday. Of course I will link to this post of yours. I will email Sylvia with the same question. This is distressing news indeed! I was hoping to see you donning your latest find. Of course, if Sylvia, has no objections please feel free to use my photo. On my blog this week. Title Styling failure of a coral wrap. Perhaps would you consider doing this for a hot humid place like Sydney is now. We still have to survive hot February here. I’m so happy to hear you enjoyed the article. Oh dear, a wool sweater and pants would be quite impossible for Sydney, in February! I’ve noted your request to do a summer version of this article. Thanks ever so much for your suggestion! Next post: How to wear red – your comprehensive guide on wearing the color of love!